See recent festive blog posts here! are an excellent substitute for a gluten free version, easier too, we use them all the time. Melt the margarine (in a large pan for mixing) and cook the celery and leek in it for a few minutes. Mix the yeast extract into the hot water (alternatively you could use any stock you like) and add this to the leek and celery. Stir in the soya flour, nuts, herbs, breadcrumbs and salt and pepper and mix well. Allow to cool slightly while you grease a loaf tin. Place half the nut roast mixture in the tin and press down well – then add the sage and onion stuffing (pressing down well again) and place the rest of the nut roast mixture on top. Bake in the oven for about 40 minutes at 180/360 then turn out of the tin and slice. Nice served with all the traditional trimmings. Variations:- you can substitute wine (red or white) or soya milk for the water and yeast extract. 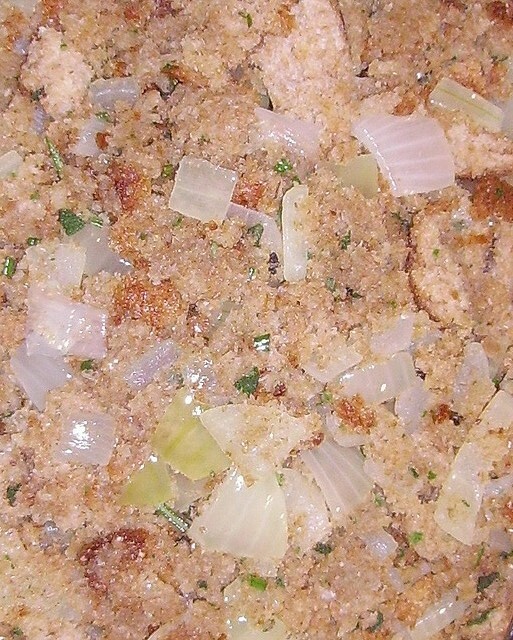 The sage and onion stuffing is optional – it works just as well without it and might actually slice up easier! A layer of sliced mushrooms and garlic is an alternative to the stuffing. Pictured roast is made with red onion and lots of fresh rosemary. Speaking of rosemary, an absolutely perfect accompaniment for any nut roast either hot or sliced up cold in sandwiches, is the rosemary and redcurrant jelly detailed here on the blog. If reading this in winter, sorry, it’s a bit late to go out and get redcurrants (though rosemary plants grow all year round! ), but it’s a great one to make for next year. A jar of that would be a very nice gift too. Also see our lentil walnut roast and chestnut roast (both gluten free). 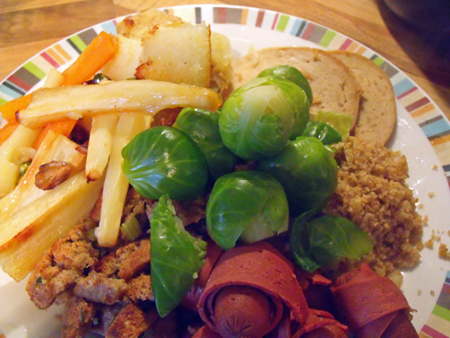 Nice served with gravy, roast potatoes, stuffing, vegan sausages, cranberry sauce and vegetables of your choice – a feast! Pictured puff was very easy, missing out the sealing up edges part, just plonking it between 2 pieces of pastry in a tin with sides!! 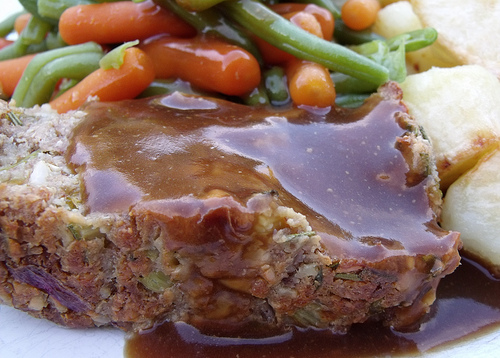 Or go the easy route and get a Tofurky Roast with herb gravy from online (and instore) vegan supermarket GreenBay! 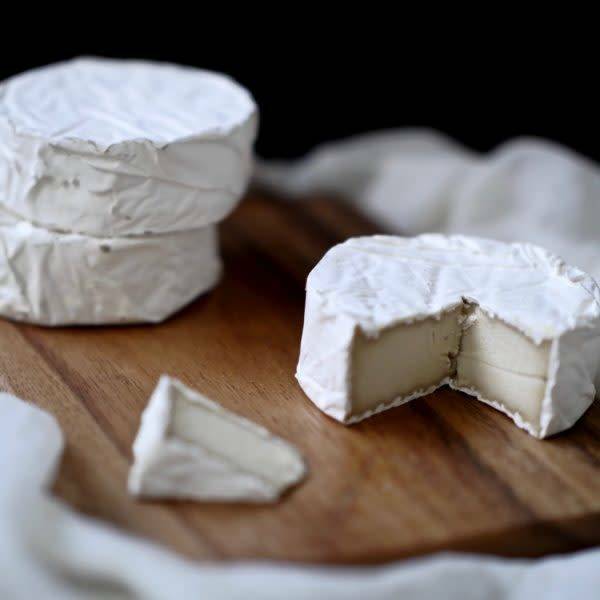 GreenBay sell a variety of gourmet vegan products that would be great for Christmas treats such as cheeses (including Camembert), steak and bacon etc. Jar of antipasto mushrooms, minus a tbsp mushrooms (make sure they are vegan), drain and reserve the oil. 1 tsp mixed herbs and some salt and pepper. Put some of the reserved mushroom oil in a pan and saute the onions and garlic until soft, add the rice and mix it all together. Add all the different mushrooms and the oregano if dried. Mix again and then gradually add the stock stirring constantly for that creamy risotto texture. More or less liquid may be needed. Add fresh herbs , mix and set aside. chop an onion finely and mix it with 1 cup oats to 1/2 cup suet,1 tsp mixed herbs and some salt and pepper. bind with a little water to form a sausage…be careful not to add too much water. Have ready some defrosted vegan puff pastry rolled out into a rectangle. Get the puff pastry and spread it lightly with sundried tomato paste and stick basil leaves on to this. Get the cooled mushroom risotto and spread it onto the pastry leaving room at all ends… you wont need all the risotto. On top of this place the soya mince filling and then place the stuffing sausage along the centre. Fold up the sides until they meet in the middle…hopefully!! If they are reluctant to stick down then brush with a little soya milk. Put on a baking tray. It is advisable, if possible, to raise the pastry parcel off the tray using a rack as I have found the bottom has a tendency to burn. You can now leave it until Christmas Day! To cook follow the temperature guide on the packet of puff pastry. Easy! Not exactly a traditional Yule/Christmas dish, but it’s red, white, and green, so it fits. SAUCE: About 28 ounces/750g of your favorite pasta sauce, homemade or prepackaged. Plop tofu into a medium-sized mixing bowl and mash/crumble with your hands. Add spinach and fold into tofu with a fork, using fork to break up strands of spinach and mix evenly with the crumbled tofu. Stir in Italian seasoning, onions, and mushrooms. Boil about 10 manicotti tubes just shy of al dente (they won’t fall apart this way when you’re stuffing them) and drain. Use your fingers to push clumps of filling into the manicotti tubes till each one is plump and full. Lay them in a covered casserole dish (more than one layer is O.K.) and pour your favorite tomato-based pasta sauce (homemade or bottled) over the whole thing. Cover and bake at 350 degrees Fahrenheit for about an hour, maybe a little less (say, 45 minutes) if you have the manicotti spread out in a single layer. Remove from oven and give it a few minutes to cool off before attempting to eat. Note: I have to keep my sodium intake low, so I don’t add salt to anything I make from scratch (except some baked goods), so some of you might prefer to add a. 1/2 teaspoon of salt to the filling. This is such a bright and flavourful recipe, it would make a good addition to a festive meal! and some frozen puff pastry! 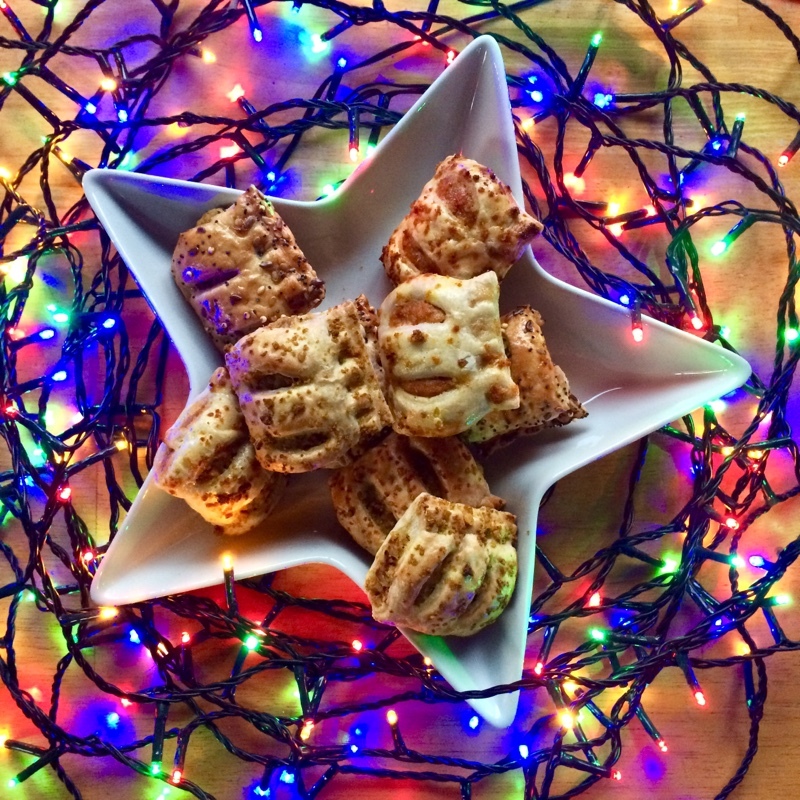 Simply make up the nut roast mix and place it in the puff pastry in roll shapes. Nice done like cocktail sausage rolls for serving with drinks. Bake in a medium oven for about 20 minutes. Par boil the potatoes then just when they are beginning to soften remove from heat and drain. Place in baking tray and rub the coating all over them (careful!) – roast in a hot oven until nice and crispy (30 minutes plus). You might want to baste with a little more oil half way through for extra crispiness! : sesame roast potatoes – coat the potatoes in sunflower oil and plenty sesame seeds before roasting – this has a lovely flavour too. Pictured are plain roast pots coated in flour prior to roasting and the oil heated in a hot oven first and also roast parsnips and peppers roasted in a mixture of sunflower oil and maple syrup. Melt the margarine in a saucepan and then cook the onion in it until soft. Break up the wholemeal bread with your hands (into fairly small pieces) and then mix into the onion and margarine with the sage and salt. This can be pressed into an oven-proof bowl for baking or if you like meat analogues it can be sandwiched between two Redwood Cheatin’ Turkey Roasts (available from GreenBay Vegan Supermarket and health food shops), wrapped in foil and baked in the oven! Cook the onion in the oil until soft and then stir in the oatmeal and salt and cook for a few minutes longer, stirring frequently to prevent sticking – then use as Sage and onion stuffing. For starters see cream of tomato soup and mini pizza bites. Playmobil do a lovely range of non-edible Advent Calendars, with great scenes to build from traditional Nativity to dragons, unicorns, pirates and Santa’s workshop. 1 batch of vegan chocolate ‘butter’ icing: Beat together half a cup/130g/4oz vegan margarine with 1 and a third cups/210g/7 oz sifted icing sugar and one tablespoon of cocoa (also sifted to avoid lumps). Beat in a few drops of natural vanilla extract. Cut the corner off one end of the cake and turn it round to look like a branch (excuse rough drawing!) – arrange on the cake board or plate. Secure the branch with some of the icing. With a knife smooth off the corners of the log to make it rounded. Decorate to your hearts content. Cut the cake into small rectangles ( 10 cm. X 4 cm. and 2 or 3 cm. deep). Cut thin pieces of marzipan and place on top of the cakes. Pour melted chocolate over the top of each log, decorate to your hearts content and then dust with the icing sugar (snow!). Delicious and colourful biscuits or cookies – the ‘jewels’ are optional but very bright and special – makes about 25 medium (3 inch/9cm) biscuits. Preheat oven to 200C/400F and grease baking sheets. Cream together the sugar and marg. Mix in the soya milk and vanilla and then the flour. The mixing of the flour is best done with your hands. You should have a workable dough (add more flour if it’s too wet or more soya milk if too dry and doesn’t hold together well). 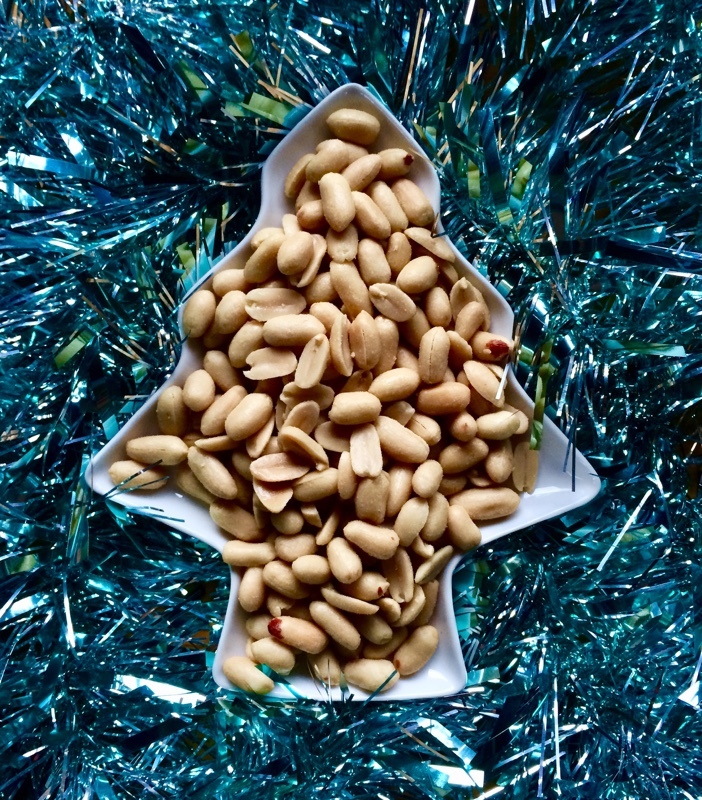 Roll out on a floured board (to just under 1 cm thick) and cut into shapes – cutters in festive shaped such as stars, trees and angels are lovely but plain round ones are effective too – you can use a drinking glass if you don’t have cutters. Lay on baking sheets. Make a hole in the middle of each biscuit – plain round, diamonds, stars – whatever you like, as long as it is big enough for your sweet! Place a sweet in each hole. Bake for about 10 minutes for soft bake cookies or a little longer for dryer, crunchy ones. The sweets will melt down and fill the hole in the oven and then reset once cool. If you want these for tree decoration ONLY you can prelong their life by replacing the sugar in the recipe with salt and adding a couple of tablespoons of PVA glue to the mix (do not eat after doing this option!!) Prior to baking make a small hole in the top with a drinking straw – once cooked and cooled you can thread ribbons through for hanging. For four people, blend up: 2 ripe avocados, 3 bananas, an inch or so block of fresh peeled ginger and 1 or 2 tablespoons of cocoa (or cacao if you would like to keep this totally raw). That’s it! It’s rich and creamy and surprisingly good for you! Optional variants: add the grated rind of an orange, or exchange the ginger for a little chilli, fresh or dried. Coating of choice – cocoa, chopped nuts, coconut etc. Mix everything together and then squeeze into balls (about 5 cm. diameter) and roll in the coating. Place in petit four cases (or on a festive napkin as in slightly bizarre picture). Making your own sweets is actually quite fun – children have a great time with this too. They are also nice gifts if placed in a pretty box or packet. Vegan chocolate – I recommend Maya Gold for these – it’s orange spiciness is perfect for this time of year. It’s very simple! Melt the chocolate and then dip things in it – nuts, marzipan balls, dates – and then place them on a sheet of grease-proof paper to set. Decorate with angelica, glace cherries (can be made to look like holly) and flaked almonds before the chocolate sets and then you can sprinkle with cocoa, coconut or icing sugar. Dates can be destoned and stuffed with marzipan for a non-chocolate treat. Place in petit four cases and enjoy! Mix all ingredients ,except the brandy, together in a bowl then cover and leave for 12 hours. To prevent fermentation place the mincemeat in a 120C/ 225F oven for 3 hours. Then allow to cool, stir in brandy and put in clean jars and seal. Grease a 2 pint pudding basin. Put the soaked fruit, cherries and ground almonds into a large bowl. Add the flour, salt, spices, sugar, breadcrumbs, suet, lemon zest and juice, treacle, soya milk and 4 tbsp sherry. Mix well to make a soft mixture. Spoon into the basin, cover with two layers of greased foil and tie down. Steam for 4 hours. Cool. Cover with a circle of greaseproof paper and two layers of tinfoil. To reheat steam for three hours as before. (I have to say that when I make it I prick the pudding and feed some more sherry or brandy into it…) and don’t forget that after it is reheated pour MORE brandy over it and set it on fire. 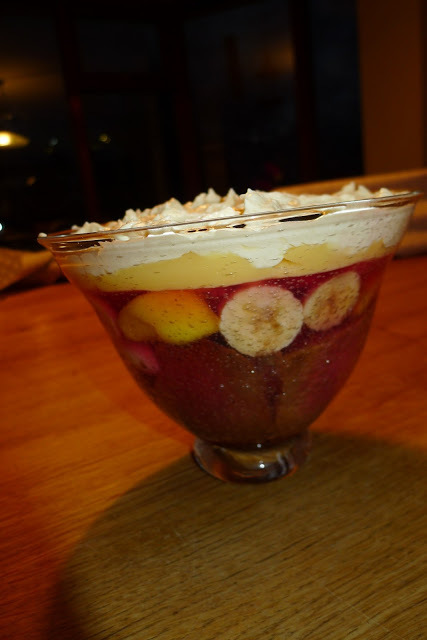 Vegan Trifle also by Catriona. and pour on top of everything… leave to set. Make up custard with soya milk and pour that on top of the set jelly. Leave that to set. Now put on a thick soya cream made with…2 tbsp cornflour, 2 oz/60g vegan margarine, 1 oz/30g sugar, 1/2 tsp vanilla essence and 1/2 pt/250ml/1 cup of soya milk… blend the cornflour with a little soya milk. Add the rest of the milk gradually and transfer to a saucepan. Bring to the boil gently and stir until the mixture thickens. Set aside to cool. Cream the margarine with the sugar until pale in colour. Beat in the cooled cornflour mixture a little at a time. Add the vanilla essence. Put the cream layer on top of the chilled custard layer. Decorate with fresh fruit and then eat voraciously. 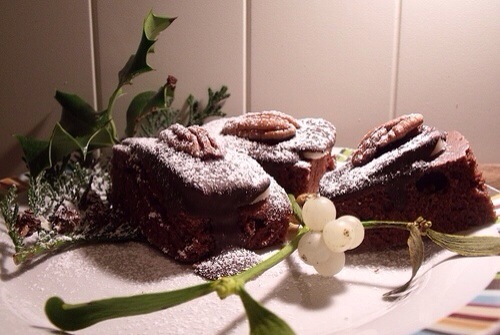 The cream can also be turned into brandy cream by adding a spoonful of brandy…serve with Christmas pudding. 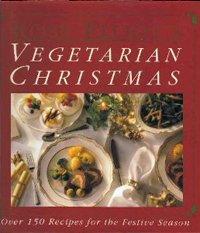 ‘Vegetarian Christmas’ by Rose Elliot. Not exclusively vegan but there is a plethora of vegan delights included and most of the lacto-ovo recipes are easily ‘veganisable’. Our favourite Christmas dinner of Chestnut and Red wine pate en croute is one of many included here along with lots of advice on taking the work out of Christmas catering. This book is full of ideas for lots of special touches which can be prepared early and frozen – a firm favourite. Now out of print but the hardcover is available cheaply from both UK and USA Amazons below and has lots of lovely photos throughout 🙂 We love this book so much we even wrote a blog post on it! ‘Cooking by the Seasons – simple vegetarian feasts’ – a beautiful collection of recipes divided into the four main seasons. Most recipes are either vegan or very easily veganised – there is even a tofu salad especially for vegan goddesses! Information is given on the eight major sabbats (summer solstice, Yule etc.) along with suggested menus – suggestions for Yule include mulled wine, winter solstice pumpkin soup, red, white and green lasange and hazelnut ice cream and many, many ideas for everyday feasts. There is a really good vegan version of macaroni cheese – baked shells with brocolli and tomato. Yum yum yum. ‘Letters from Father Christmas’ by JRR Tolkien. Weve all been enchanted by this lovely book of letters. Tolkien wrote one to his children each year, right down to designing beautiful stamps. The artwork throughout is stunning and the stories amusing, building each year. A lovely book. From Ruby Roth, there’s the great ‘Help Yourself Cookbook for Kids: 60 Easy Plant-Based Recipes Kids Can Make to Stay Healthy and Save the Earth.’ Colourful and cute, full of interesting facts, collage photo illustrations and cute animal characters. The Book People – always worth checking out what these people have in stock – heavily discounted items. 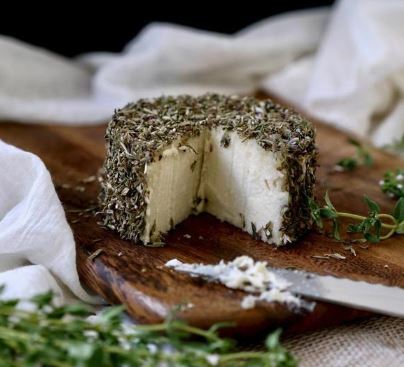 Don’t miss GreenBay Vegan Supermarket for gourmet products such as the cheeses below! 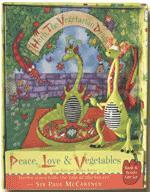 Montezuma’s – lots of vegan goodies including a wonderful Advent Calendar. Approved Food sell clearance food and other goods, lots of festive things at this time of year. They often stock health food brands and vegan specialities. It changes daily. Bargains to be had. Ethical Superstore – stocks some fab food and drink from various green and fairtrade brands. Frugal Christmas – economical ideas for Christmas – shopping, recipes, cards and decorations. Vegan Christmas Recipes from Parsley Soup – some really nice festive offerings from this vegan recipe site. Everything5Pounds sell unsold stock from top High st. brands, all detagged, and all £5. Some bargains to be had across clothing, footwear and homeware! eBay is also a source of all sorts of vegan goodness from vegan boots and clothing to books and bags. Swizzels Lovehearts make nice little stocking fillers (or cake toppers)! Also vegan are their Parma Violets, Rainbow Drops, Fizzers and their Lovehearts Candy Lipsticks. The Book People – this company sells sets of book for the price you usually pay for one – great way to stock up on gifts! Planet Warrior sell beautiful yoga wear made from recycled materials. Animal Aid – chocolate, wine, clothing, footwear, toiletries, books, cards, mugs, magnets. Online ordering. VIVA! (Vegetarians and Vegans Voice for Animals) chocolates, wine, toys, books, mugs, badges, clothing, cards. Online ordering. Green People – wonderful vegan toiletries with no nasty chemicals – gorgeous, we love them. The greatest single food related item we’ve ever invested in is The Vitamix. If you’re looking for a lavish, health-enhancing gift for a vegan (or anyone) this is it. Available from Amazon.co.uk and Amazon.com, ours is still blasting away 8 years on, pureeing food up into the smoothest smoothies and soups and sauces. See our blender page for more info and recipes. eBay is a source of all sorts of vegan goodness from vegan boots and clothing to books and bags.